The screenwriter and novelist Chris Millis knocked our socks off with his dynamic, smart and funny Skype presentation of The Three-Act Structure. Anything about structure is so, so helpful to the literary writer who tends to lead with the writing itself. People were excited for the rest of the week after Chris's presentation. 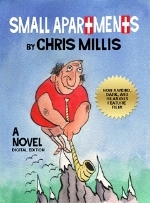 Chris adapted his novel Small Apartments into the cult film that premiered at the South By Southwest Film Festival and is distributed worldwide by Sony Pictures. He’s worked closely with many actors, including Billy Crystal, James Caan, Johnny Knoxville, Matt Lucas, Rosie Perez, Rebel Wilson, James Marsden, Rob Schneider—as well as top directors, producers, and studio executives. In Spring 2015, Chris will be the Visiting Writer in Screenwriting for the MFA in Creative Writing Program at The College of Saint Rose (Albany, NY). He holds a B.A. in Art from SUNY Buffalo State College (Buffalo, NY) and an MFA in Creative Writing from Goddard College (Plainfield, VT). Watch the official Sony Pictures trailer for Small Apartments.